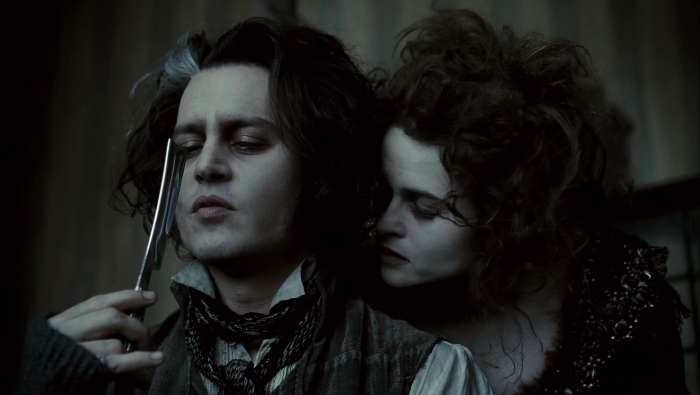 Movie Review: Sweeney Todd Starring Johnny Depp And Helena Bonham Carter - Are You Screening? A quick trip to IMDb.com will get you a whopping 308 reviews to choose from (here’s the link, knock yourself out). In that plethora of reviews (I’m about to talk like I’ve read them all, but come on) few critics diverge greatly in terms of general comment on the film. This review is going to say things I am willing to bet are heretofore unmentioned.I remember the first time I watched The Sound of Music (which, fine, is an okay movie), and the only thoughts I could put together were that it was creepy… and disgusting. This was a reaction near unexplainable. Creepy, I suppose, in a sense similar to just about any idea of a family run with military precision, and equally in the same sense that anything which takes clichéd emotional situations to such extremes is just a bit creepy (perhaps like a movie that doesn’t just run over a dog, but runs over it again… and again). Disgusting, I suppose, in a way something like eating four chocolate cakes without stopping, and then being presented with a chocolate cake. The Sound of Music evoked, after some span of being force-fed its treacley goodness, the same sort of reaction of disgust to every next bit of syrup.I throw this out here simply to call attention to the idea that people, critics or not, are going to have very different reactions to things, often wildly different, and moreover they ought to have wildly different reactions. I won’t tell you how many of those 308 reviews I’ve read (because it isn’t all of them, but it is somehow too many), but they were all very similar. What’s surprising, is that this is not generally the case. This difference of reaction I refer to nearly always (as far as I’ve seen) shows up quite noticeably, especially among those doing a lot of movie reviewing… like, let’s say it was their job. Not so much here. And, I am bringing all of this up, because no one seems to have had anything remotely like my reaction, and that includes those who gave Sweeney Todd their highest recommendation (or most stars, or whatever). As the credits began to roll, all I could think, for about five full minutes, was, “That was beautiful.” That’s it. As those five minutes ticked by, and I started moving into the next five minutes of my life, all I could think was, “’That was beautiful,’ is not going to count as a movie review.” But, it was really my only reaction. I don’t mean any of the 2-10 definitions either. I mean definition number one, beauty… being full of. There were just buckets of blood, people murdered out-of-hand every time you turned around, cannibalism, severed arteries throwing blood every which way, a meat grinder that could hold a Volkswagen Beetle filled with arms and legs… and so help me God, I had no other thoughts about the film at all. Everyone involved in the film was excellent. Johnny Depp was brilliant, and I like him to begin with. Helena Bonham Carter was surprisingly good, and amazingly adept at flowing through the role. Tim Burton made me forgive him for Planet of the Apes. But, I could think of anything to say…, and I’m about to not say it. The story has been around at least since Sweeney Todd was given a name in 1846, but Charles Dickens referenced the tale several years earlier as something of an urban legend that had been around the block for who knows how long (wiki). In this version, which follows the Sondheim musical, Sweeney Todd is actually Benjamin Barker, a one-time barber who was sentenced to Australia on a charge made-up by the judge who wanted to steal his wife. 18 years later, Barker returns looking for revenge, and adopts the name Sweeney Todd. He returns to the apartment he used to rent, and finds his old landlady, Mrs. Lovett, still running the pie shop below. She remembers him, and tells him that his wife poisoned herself after the judge “took” her, and to add insult to injury, the judge has adopted Benjamin’s daughter.When a chance to kill the judge slips through his fingers, Sweeney decides everyone deserves to die, and he and the Mrs. Lovett embark upon a scheme of killing whoever happens to come along, and turn a profit besides by serving them up in meat pies… well, times are hard, and meat is scarce. Now, I’m to give away everything that happens, because it’s relevant to what will follow. If you don’t want to know, I suppose you can stop reading – but, if you think knowing the story ruins the story, you aren’t likely to get much from the film in any case.Sweeney came back to London from Australia with a very young man, and that naïve, full-of-life lad (who is throughout clearly the reincarnation of Sweeney’s younger self) happens to see Sweeney’s daughter through the window of the judge’s house. He vows to “steal her,” quite early in the film. Sweeney outshines a local barber in a public competition, all in the name of creating a name for himself with the judge’s right-hand man, in the hopes that this will lead to the judge coming for a shave. He does, and thus the above-mentioned missed attempt at revenge. The upstaged barber comes to Sweeney, orphan/indentured-servant in tow, and aims to blackmail Sweeney, because he recognizes him as Benjamin Barker. Sweeney makes the would-be blackmailer his first kill, and thus Sweeney and the Mrs. Lovett adopt the boy orphan. The orphan promptly develops a sort of Oedipus complex, and believes Sweeney is evil, and he must save the Mrs. Lovett from him. Meanwhile, the judge has gotten it into his mind to marry his ward, but she throws our lad a key to the house, in the hopes that he will rescue her. The judge discovers this, and has her locked in an asylum. The young lad returns to Sweeney to ask for help, and Sweeney arranges a plan to rescue her. As all this is going on, Sweeney is murdering everyone he runs into, and the pie shop is doing a brisk business. Now, the end gets tricky. The young orphan stumbles onto the truth, and makes a duck into the sewers below the basement. While Sweeney and the landlady are searching for him, our young lad returns with Sweeney’s daughter, disguised as a man, and leaves her in Sweeney’s barbershop while he goes to arrange transportation so they can run away. When she hears someone coming she hides in a trunk. The judge returns to Sweeney’s barbershop believing he may know where the young sailor is. Sweeney quickly convinces the judge that his ward has actually repented, and now wishes to marry the judge… how ‘bout a shave? Whack, revenge, Sweeney greatly pleased. Before Sweeney can let himself celebrate, he notices someone hiding in the trunk, someone who obviously saw the butchery. Hello chap hiding in my trunk, how ‘bout a shave? In the midst of all this, the crazy, old beggar woman who lives down the lane comes in (we’ve seen her several times, I just haven’t mentioned her), well… you probably don’t need a shave, but whack, tidy, down in the basement you go. Now, greatly relieved at how things have turned out, Sweeney makes his way to the basement, Mrs. Lovett is already there. Things seem trimmed up like a Christmas goose, and all is right with the world. Sweeney sings (did I mention this is a musical) of how his razor can sleep now. But then, Sweeney gets a look at that old, beggar woman. “Don’t I know you, sir,” she said. Sweeney discovers, of course, that he has just killed his own wife, and at the same stroke that Mrs. Lovett has been playing him the entire time. She knew his wife was alive, and she made her own bid to steal him from his wife, just as the judge had stolen his wife from him. Well, before you can say, “Bob’s you uncle,” Sweeney does for Mrs. Lovett, and then sits cradling his dead wife (never even getting to realize he has killed his daughter as well), whereupon the orphan returns from the sewer and promptly slits Sweeney’s throat. The End.I force you to read all that for several hundred words (knowing full well that, hopefully, many of you know the story already), because I hope that speaking from a fully-disclosed viewpoint, I can manage some explanation of my reaction to this film. You’ll recall (it was a while ago) that I was absolutely blasted by an overwhelming appreciation of this film as something simply beautiful. First, tragedy is all but lost to us as an art form, and it is a grave loss to not only our culture, but our race. There is a certain magic about the well-delivered experience of a really good tragedy, and not the pseudo-tragic farces that come along once in a while as a sort of cultural-mind placation, and whoops everyone’s fine in the end. There’s something to be said for a really good death, and for death in general. There is, in fact, a very real sense in which I do not believe a person is really, fully human until someone close to them has died. I think, and I’ll tell you straight out that I don’t absolutely understand my reaction myself, that what is so beautiful about this film is the sweet sincerity of the death. Not the murder, and the blood flying per se, but the madness. Everything is dark in the film, and everyone is evil. It’s 19th century-ish London, and the condition of humanity is just about the worst ever known. If you aren’t evil, you’re evil’s victim. If you aren’t eating your fellow man today, you’ll be eaten tomorrow. In this scene of human depravity, faced with Sweeney’s circumstance, wouldn’t you go mad? But, that isn’t what the film is aiming at. Oughtn’t you go mad? Any one of the countless rabble living in insanity itself might go mad. Could go mad. But, is Benjamin Barker perhaps obligated to do so? The revenge idea at the beginning, that’s easy. Everyone’s doing that. There’s a certain code involved there. Even those that cheat the system, take advantage of their situation, and try to get what they want even if it is at the expense of others, are somehow still playing by the rules. Ahh… but, to go mad. To take what comes, and for no event, to call it unfair. It is something that can’t help but bring to mind the Joker of the recent Batman film. It isn’t a lifestyle choice I’m embracing or condoning, but there is within its expression a humanity laid bare. To, in a sense, see humanity by looking at it from the outside.There is a part of us, and I won’t say an animal part, because the idea is overused, and moreover it is wrong; but there is a part of us that is something like pure feeling (I won’t say emotion either, because I don’t believe feelings are emotions). We should probably reign that part of us in to some degree, and we think we’ve agreed to that, but what we’ve really agreed to is trying to kill it off entirely. We are all okay with the revenge bit, even if it is only in one form or another. Some of us, presented with Sweeney Todd’s circumstances at the beginning of the film, wouldn’t sneeze at his killing the judge. Others might suggest that Sweeney ought to find some way to make the truth known, and prove the judge had him falsely convicted, thereby bringing about the wrath of that same justice system. But, somewhere deep inside, there is a part of everyone that, given Sweeney’s circumstances, rages the kind of rage that would just turn the whole world off if it could. Killing that rage comes with a price. Sweeney, as he who can be open to that rage, is also able to love the kind of love that would turn the whole world on. The kind, in fact, that does. The kind that calls itself happiness, and others call it naïve for doing so. Sweeney indeed refers to his younger self as naïve. This, only because he knows the love that kills the world when it’s gone. Sweeney goes mad, kills, because those he kills have gone mad first, killing themselves by killing their feeling. Not the sort of feeling. The kind of feeling. The pseudo-feeling. The I’m okay, you’re okay, can’t we all just get along feeling. The real feeling. In the end, Sweeney seems to realize just what is so wrong about killing that feeling, that would have perhaps kept him sane. In the end, as he so obviously lets himself be killed. He realizes, or seems to, that killing the one is killing them all, because all feelings… all feelings are the same feeling, and they are this – Life!